What political, macroeconomic, fiscal, and infrastructure changes have there been in Latin American in 2014 and how might that effect the IT market in 2015? The biggest issue now in Latin America is the falling price of commodities. The economies of the bigger countries here are powered by the export of either natural resources or grains. Because of the falling price of oil, Venezuela has had to cut its budget and Colombia is raising its taxes temporarily to cover its deficit. Conservative politicians in Chile are howling about the slowing economy there as copper prices fall. But one could say those complaints are mainly levied as a means to attack the Socialist president’s plans to wrestle the profit motive out of the educational system there and raise taxes. In fact, the outlook for growth for next year in the region would cause envy across Europe. Here are the current forecasts from The Economist. 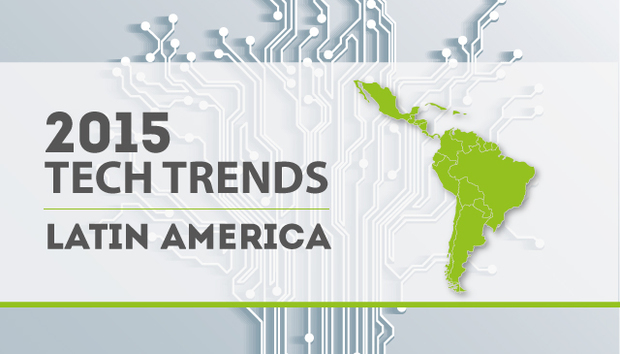 What are some of the issues on the ground in LatAm that might impact the IT market in 2015? Alejandro Vasquez is business development director for PSL in Colombia. This is a 500-employee software development and system integration company with offices in Colombia, Mexico and the US. Vasquez says that because of falling commodity prices, companies and governments are “going into maintenance mode. Next year will be tougher. People are going to be running tight budgets.” But on the other hand Vasquez adds it is a good time to push organisations onto the cloud because companies can save money deploying there. Vasquez explains that cloud computing is making inroads in the Latin American market. Surprisingly, mighty Amazon Web Services is not the market leader in Colombia. Instead, local cloud companies lead the market. Security concerns have kept banks and healthcare companies from adopting the public cloud but “many large companies have already migrated to the cloud or are in the process of migrating to the cloud,” especially for ERP and CRM. Mexico in particular is a conservative market with regards to adopting the cloud, with the exception of CRM. One of the leading Mexican cloud providers is Kio Networks. Taxes are going up in Colombia. They are rising in Chile too as the government tries to fix the other regional infrastructure issue, which is the dismal state of grade school education in the region, according to the OECD. Chilean taxes are rising from 20% to 25% on business to fund the government’s plan to provide free grade-school and university education. Currently most parents in Chile pay to send their kids to public schools and universities that are public only in name, since they operate on a for-profit basis. Because of this search for profit, there are no real research universities and no Stanford-like environment to foster new ideas. Still, the Chilean government funds the Startup Chile incubator program, handing out generous funds to companies with new ideas, 80% of which are not even Chilean. In Colombia, the government incubator programme is Creame. Those are good alternatives for bright people who cannot get a US immigration visa. A growing spot for Latin America is the market for ‘near-shoring’ development because, PSL’s Vasquez says, “People are tired of working with people 13 hours away.” He claims that market is growing 50% per year. One problem is that most people do not speak English here, so there are various government efforts to try to encourage engineers to learn it. That could of course take a long time. Still one is surprised to see how many programmers do speak English and speak it well, having learned it from HBO and Sony. Jothanan Tarud is CEO of Koombea, a 90-person web and mobile application development company in Barranquilla, Colombia, serving the US market primarily. Asked about the growth or lack of growth of the market for mobile applications in LatAm, he says, “In mobile, we are starting to look at LatAm as a whole.” He adds that Colombia has just adopted a policy to let people change their mobile phone providers and keep their same number. This will foster competition where it is lacking. The high price of cell phone service in Mexico and Chile are definitely impediments to the growth of mobile applications there. In Chile and Mexico it costs more than $0.20 per minute to make a cell phone call in many cases. In Chile, there are very high interconnect charges between cellular providers and people usually are blocked in their office from dialing cell phones from land lines, because of the high cost. In Mexico, the world’s second richest man, Carlos Slim, sits atop the phone monopoly there, although he has plans to introduce an unlimited internet plan, a luxury that has faded away even in the US where 4G speeds gobble up cell tower bandwidth. President Nieto has passed reforms to open up the telecoms market to competition. Colombia is a vast country of high temperate-to-chilly Andes mountain valleys, where cities like Bogota, Medellin and Cali are located, and hot and muggy remote jungles, where it is difficult to provide internet service or even build a road. To address that, Colombia has a plan called Vive Digital (Go Forward Digital) to bring fibre-optic cable to all the towns in the country. Satellite will be used where it is impossible to unfurl wire across the many rivers and jungle terrain. The other infrastructure issue in LatAm is that the lack of a delivery infrastructure is an impediment to the growth of online commerce. But eBay invested in the region’s leading online ecommerce company, MercadoLibre of Argentina. Also, advertising from the Chinese e-commerce giant Alibaba is starting to show up in online newspapers as it expands in the region. But shopping online anywhere in Latin America is not as widespread as in developed nations. In Colombia, there is healthy competition for package delivery. You can send packages across the country cheaply. Still, many Colombians prefer to buy from Amazon.com in the US and bundle their shipments with freight forwarding companies who ship their items to Colombia. Further south in the Southern Cone in Chile you do not see the brown or red and white trucks of UPS and FedEx -- just Chile Express. Not many people buy goods online yet. It could be a ‘cart before the horse’ issue too, meaning the market does not support widespread delivery and the market cannot grow because of the lack of low cost and speedy delivery services. So while Latin America still is enjoying good economic growth, except in Brazil and Argentina, where political problems and outright corruption are an issue, the region is still very much a developing region with lots of infrastructure and cultural issues to overcome to see large advances in mobile computing and ecommerce. The good news is that the revolutions of 20 and 30 years are gone for the most part and there is political stability in most places. Even former Communist guerillas like Nicaragua’s president Daniel Ortega have embraced capitalism. While the high commodity prices of the last five years are falling off, that prosperity lifted millions out of poverty in places like Brazil and Peru, creating a middle class who buy iPads and iPhones. That critical mass should power e-commerce and mobile computing for years to come. Walker Rowe is a US citizen living and working in Santiago, Chile. There he edits the online magazine SouthernPacificReview.com and writes the blog "The Avocado Republic" about life in rural Chile. Who are today's ethical hackers?